Prosthetic dentistry includes treatment the defects of the dental crown, whole and partial edentulism, dental abrasion, and the presence of parafunctions - bruxism and bruxomania. After being diagnosed and analyzed the indications and contraindications for prosthetic treatment, a treatment plan is set. For each patient, it is strictly individual. Generally prosthetics is mobile, fixed and combined: Removable prosthesis - includes all total and partial dentures, dentures plastic made of soft plastic (eg Valplast flexible dentures) model fly-skeleton dentures and more. Conventional dentures are made of acrylic plastic. The disadvantage is that they are fragile. Also the plastic is hard for the patient to get used to it and requires a long adjustment period. Dentures from Valplast - are made of soft plastic and are more comfortable for the patient. Can be used by people who have an allergy to any component of the standard pink plastic. They are highly aesthetic and shall not use metal hooks that can worse the aesthetics. Patients adapt more quickly to this type of dentures. Model cast dentures - skeleton dentures - as demonstrated by the very title they have metal skeleton. Metal plate on the palate is thin, provides strength and comfort for the patient and does not interfere with speech. 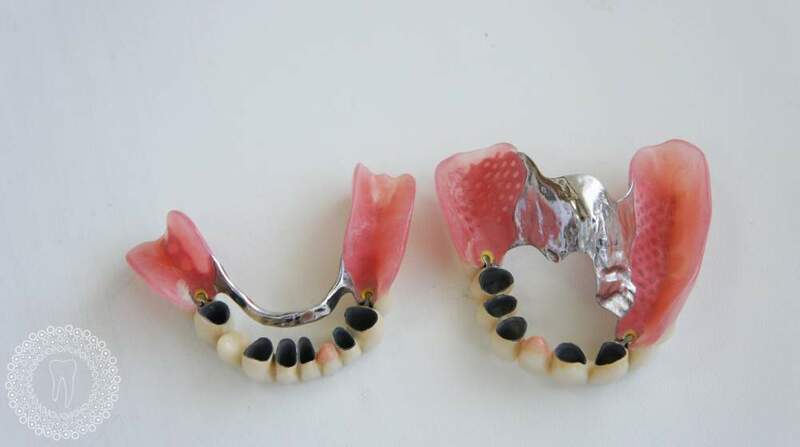 Fixed prosthesis – includes various types of crowns and bridges. Methods of grinding teeth according to the type of boundary are: Barriere (tangential) and gthreshold. Older way is a non-threshold. Barriere crowns have several disadvantages: Over contouring crown edge, leads to damage to the marginal periodontium; Often crowns are wider at the base, because there is no clear limit where to you need to reach the crown edge; Poor aesthetics due to exposure of the tooth stump; Recolor of the gum. The advantages of filing threshold are indisputable: optimal placement of crown edge against tooth structure and surrounding soft tissues; Prevention of aesthetics and harmful over counturing of the gum in the cervical area of the tooth; Ability to accurately recreate the preparation limit on working patterns. Depending on the material they are made of crowns or bridges can be : ceramic-metal (with metal frame), all-ceramic, zirconia. Ceramic-metal crown is a good choice for severely damaged teeth. The inner part of the crown consists of a metal cap on which is applied layer by layer ceramic materials. The relationship between ceramic and metal alloy is a chemical that provides exceptional strength. There is a risk however,of recoloring the gum from the metal cap. Therefore, for excellent aesthetics, especially in the anterior part of the dentition is desirable to restorate with all-ceramic structures. All-ceramic crowns are made mainly by two methods - by layering or pressing. 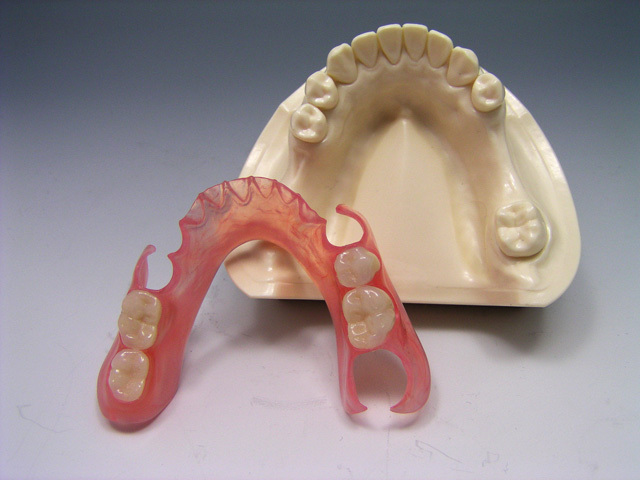 -removable construction (model cast prosthesis, dentures). Bruxomania is parafunctional reaction of clenching the teeth in a static position without movement of the mandible. Bruxism (phenomenon Carol) - is parafunctional reaction of gnashing the teeth that results in horizontal and lateral sliding jaw movements, under the action of strong masseter muscles tense. The injuries caused by these parafunctions are expressed in periodontal changes, pain in jaw joints and masticatory muscles, changes in hard dental tissues (dental abrasion) fractures in ceramic restorations and more. Prophylaxis is made by special occlusal splints transparent elastic plates. Dental impressions from the upper and lower jaws are taken. The plates are used at night (during sleep) and protect teeth from bad habit. It is also desirable patients with dental implants, complete restoration with crowns and / or bridges (zirconium ceramic) to wear these plates.